This is one of the finest examples of this type of bead we have seen for a long time. ANCIENT SULEMANI / BHAISAJYAGURU dZi. This rare S ulemani / B haisajyaguru dZi bead was sourced in the Himalayan Kingdom of Nepal. Bead length 21.66 mm. Bead maximum diameter: 19.12 mm. People string a few of these a n cient beads with other prized beads and sometimes use one bead on a sacred Mala. 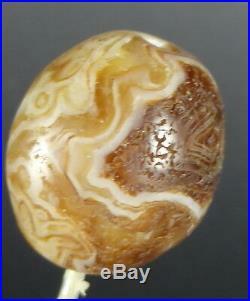 This ancient Sulemani / Bhaisajyaguru dZi banded agate bead is especially popular in Tibet and areas close by. Beads such as these were traded to be a Part of the religious and cultural lives of the inhabitants of Ladakh, Tibet, Nepal and Bhutan. There is mixed opinion as to this beads age but it is very old if not an ancient bead. Cracks made by a thousand cold winters. If an agate bead has been’lucky’ enough to’sleep’ for hundreds or thousands of years in areas where the temperature goes below zero during winter the moisture in the bead will make small circular cracks in the surface of the bead. This is due to the expansion of the water molecules when they turn into ice. This beautiful sign of age is only to be seen in beads from the Himalayas and Afghanistan and other places that have frost in the winter. Beads that have dwelled in areas with hotter climates will not display these marks of age. The appearance of these cracks will also depend on the hardness and porousness of the stone. A dense agate stone bead with less water inside will even survive the winters of the Himalayas without these cracks. This is a rare very hard to acquire ancient bead that was sourced in the Himalayan Kingdom of Nepal. According to Buddhist tradition these rare Sulemani / Bhaisajyaguru dZi banded agate beads remove the root of all disease, they will also ensure good health and a long and successful life. Spiritual Sky is releasing these special sacred and empowered items to the world. The reason for the release of these items is that the Earth as we know it is now a dark and dangerous place and we would like spiritual and sacred people to be part of the new awakening. There are very few people in the world who can feel and sense and need this sacred and special power. This is a n ancient real natural. Sulemani / Bhaisajyaguru dZi banded agate bead. This bead has fantastic markings. These ancient beads are prized by the Tibetan’s and people from the Himalayan regions. To heal someone, you must first know why people suffer. If through healing them, you can show them how to stop suffering, you have fulfilled your role as a physician. At he heart of all suffering there is a spiritual remedy that comes about from knowing the relationships between karma and suffering. Karma comes from the chaos that exists within all living creatures, all aspects of this world and the universe at large. Some chaos is good, some indifferent, some bad, but it is the stuff from which happiness and then enlightenment can be made. Many of us are trying to find peace, a small place where we can enjoy our lives. We look around and watch the world go by. All we wish to do is to find a small amount of peace and tranquility in the world today. There are huge amounts of negative and bad energy flowing. Many dark energies are around and trying to possess us. They try to find a host, when we are at a low point in our lives, when we are weak and vunerable. THE TRUE MEANING OF LIFE. We are visitors on this planet. We are here for ninety or one hundred years at the very most. During that period, we must try to do something good. Something usefull, with our lives. If you contribute to other peoples happiness you will find the true goal. The true meaning of life. His Holiness The XIV th Dalai Lama. Our Sacred Blessed and Empowered items have PURE POSITIVE SACRED POWER and they can and will be attuned to you. Do you remember long ago that you had the ability of second sight, and other special abilities. You might never have revealed this to anyone as you felt slightly afraid and were not sure in yourself. Years later life takes its toll and you now think that these special abilities that you had years ago are now gone. These abilities NEVER GO, you still have the same abilities but you now have to clear a path to open your mind and be able to go back to your childhood and let your mind open up. When you work with our Sacred Blessed items you will soon realise that these are SACRED SPECIAL TOOLS and will work for you in many different ways. They will open up a PURE POWER FLOW FOR YOU, and enable PURE POSITIVE ENERGY to enter your divine spirit. You to go back, far back in time to when you were a child. In those days you thought that. Nothing at all was impossible, you could do anything and everything. In those days long ago your spirit had not been reduced by negativity you believed in pure and special magical powers and your mind was open to receive and discover and to understand the mysteries of life. These Sacred Blessed and Empowered items have PURE POSITIVE SACRED POWER and can and will be attuned to you. Many or us are trying to find peace a small place where we can enjoy our lives. Many dark energies are around and trying to posess us. Our sacred, rare, empowered and blessed items are being made available for the benefit of practitioners, like you, who would like to have holy objects as devotional support to your practice. Rather, we are making them available with the express wish to benefit others. All funds in excess of our costs help us to continue our activities. Sellers: Get your own map today. Track Page Views With. Auctiva’s FREE Counter. The item “Ancient Suleimani Bhaisajyaguru dZi banded Agate Bead” is in sale since Tuesday, October 4, 2016. This item is in the category “Collectables\Religion & Spirituality\Buddhism”. The seller is “spiritual-sky” and is located in Bournemouth. This item can be shipped worldwide.